Usually this isn't an issue, but can be annoying when offline. There's also the security issue of sending entire JSON payloads to a third-party server just for formatting 😳. Alternatively, maybe developers copy+paste into their chosen editors and this PR is all a waste of time — I hope not 😛. We can use collector.requestheaders to detect if the request was JSON and conditionally show the Pretty Print button. 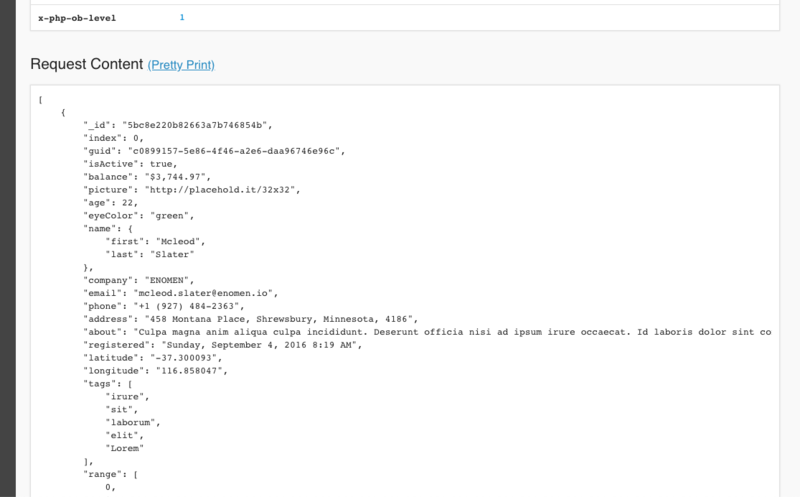 Is JSON.stringify(JSON.parse(content)); the safest, most efficient way to do this? Should the "Pretty Print" button be in-line next to the "Request Content" header? I couldn't find a pattern for this sort of thing elsewhere in the profiler. Do people want JSON formatted with 4 spaces, would 2 spaces be preferred? Should this be a configuration option stored in localStorage (such as the light/dark theme configuration)? Gather feedback and decide where to perform the pretty-print: server-side, or client-side. It was decided server-side would be better. I like this proposal a lot. I would apply this behaviour by default, without any button or toggle. To prevent issues with complex queries, I'd apply a max-height of around 500px to the container element. I think it should be pretty by default, but a Raw option could still be useful? and if we want to do it all the time (with a tab switcher to view the raw one), it would make sense to do the pretty-printing server-side. 👍 Sounds good. I'll look at getting that implemented. If we're doing the pretty-printing on the server, that would mean we're putting the entire payload into the DOM twice, once "pretty-printed", the other raw – I'm assuming most payloads aren't too big so this won't be an issue - are we okay with this? also instead of pretty JSON, wouldnt VarDumper (thus collapsible) be far more useful? Okay, so, I've taken the above feedback, rebased and updated the UI. There are now "Pretty" and "Raw" tabs. I've left the formatting down to JS for reasons discussed later. I don't have much experience with the internals of the profiler. However, from what I can workout there are a few options we have to pretty print on the server. I'm assuming the method of pretty-printing we'd use is json_encode(json_decode($requestContent), JSON_PRETTY_PRINT)) (remember, at the moment our $requestContent is a string). Alternatively, we can look for additional libraries, but I'm not sure what the stance on that is? collector is basically $this->data from RequestDataCollector.php. We could store an additional key (e.g. "content_formatted") and perform our pretty-printing during collection. Cons: Performance affect during collection; storing the entire request payload twice in the profiler. We perform the print-printing in ProfilerController::panelAction and add a key to the available twig variables https://github.com/SamFleming/symfony/blob/d56ed851b4f2d012c8633f0632feb96d17b96c17/src/Symfony/Bundle/WebProfilerBundle/Controller/ProfilerController.php#L104-L112. Pros: Not storing duplicate content. Cons: Placing Collector specific logic in the generic panelAction — should it really be the responsibility of panelAction to look into the Collector and its attributes to perform the printing? It would be great to hear some feedback on the above options as I'm not really sure which route to take. I've had to create commit 9cdcf0b as there appears to be a bug when nesting tabs in the profiler panels. Looks like until this PR it's never been required. Shall I split this out into a separate PR? Thanks for the approval @ro0NL – I've updated the regex as suggested 👌 — It will match application/hal+ld+json, are you okay with that – alternatively we could change the quantifier to ? to only match one or zero (instead of zero or more) – your thoughts here would be appreciated. I'm currently trying to setup the "Debug" tab as suggested but am struggling with some unexpected errors. I'll keep trying. @SamFleming perhaps better to introduce the debug tab in a new PR so we dont block/postpone this one (i was just brainfarting :)) But i definitively think it's a nice addition. yes, i tweaked it to more generic. Now matches foo+bar+json, foo+++json. I think we want to be tolerant yes. Anything left for me to do to get this ready for merging? let's wait :) i do have one last question though; what happens if the request content is not valid JSON? Even if the content-type says so.. does it crash the panel? Will developer see the error? 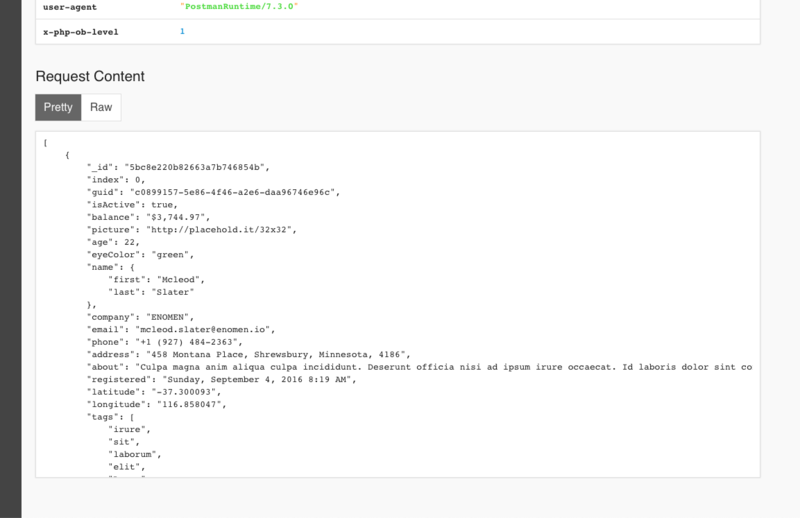 Is what shows when the JSON is invalid. json_decode will return NULL when invalid JSON is encountered, then json_encode(NULL) returns null. We could check json_last_error then display json_last_error_msg in the "Pretty" tab if there's an issue? I definitely prefer, as it removes any abiquity. However, if we're going this route, is there any point checking the Content-Type for being JSON? Is it worth attempting the json_encode(json_decode()) no matter what is in the body, then using json_last_error to determine whether the tab shows? the extra overhead might bite us as we try to parse each request content, every time. Tend to prefer the explicit check here. I also wonder if it's worth caching the result of getPrettyJson seeing as it is being called twice in twig and I'm assume json_decode(json_encode()) could be quite resource intensive... or assigning it to a variable in twig. actually we dont parse during the request :D (im tired), only during display in the profiler. But yeah, i think we should be conservative, and expand as needed. correct. We should return string|null (checking for last_error intermediary) and call it once in twig. @dunglas was there anything else you wanted me to do on this? - [x] Gather feedback and decide where to perform the pretty-print: [server-side, or client-side](symfony/symfony#28919 (comment)). | Fixed tickets | #..
Update usage example in ArrayInput doc block. I used the `mb_ord` to detect whether the amount of bytes read is valid before proceeding. I limit the number of bytes read to 4 before giving up because characters can use at most 4 bytes. The test passes with or without the fix though. +                format: "%%datetime%% %%start_tag%%%%level_name%%%%end_tag%% <comment>[%%channel%%]</> %%message%%%%context%%\n"
user has a point about that. Add a way to specify an index based on a tag attribute when injecting a tag collection into services, but also a a way to fallback to a static method on the service class. When dumping the data structures from [Ds extension](http://php.net/manual/en/book.ds.php) Symfony only shows the class name but not the actual data. So in this PR I tried to write a Caster for these data structures. Map can't be simply casted to array because it can contain objects as keys so I dump the pairs instead. I ran into an [issue](https://github.com/php-enqueue/enqueue-dev/issues/774) in the enqueue library which copied this part of code from Symfony. I'm now starting to understand what the problem is and it should most likely be fixed in Symfony as well. If you have a non-catchable pattern in requirements like f.e. a positive lookahead (.+(?=/foo/)), the generator will not accept the parameter as the parameter itself cannot fulfil the requirement, but only matches in the context of the entire path. This fix looks for lookAround in the path and ignores checking the requirements if any lookAround exists. This PR was squashed before being merged into the 4.3-dev branch (closes #27570). Added support for extract type from property's default value. private $builtinType          => string(3) "int"
- [x] Gather feedback and decide where to perform the pretty-print: [server-side, or client-side](https://github.com/symfony/symfony/pull/28919#issuecomment-431508361). This PR was squashed before being merged into the 4.3-dev branch (closes #29865). Currently, when someone runs one of the most common commands, e.g. `server:run`, but does not have a required package installed, they will get a general **'There are no commands defined...'** message. This commit adds a more useful message, informing the user about a package that might be missing and suggesting a command that should be run in order to install it, e.g. `composer require symfony/web-server-bundle --dev`. Following #30236 I've prepared two additional addons for the ghost. The first one will display a plus on February 29, to indicate it's a leap year. The second one will display a gift on October 18, to indicate it's Symfony's birthday. I would just like to point out that the addons are purely for fun, to amuse every hardcoding Symfony developer and offer a chance to smile on these few selected occasions. This PR was squashed before being merged into the 3.4 branch (closes #30243). When an empty string is passed (or objects with a similarly behaving `__toString()` method) to the constructor, the call to `decide` causes infinite recursion. Somehow, after #29411 the profiler actually shows the security firewall `ContextListener`. This listener removes itself at call time, but at this point it's wrapped reference is already in the call stack; to be displayed in the profiler. Because the wrapped listener lazily collects its priority - it asks it from the dispatcher -  we get null; the listener was already removed. This fixes it by always passing the expected priority at call time. [Form] add option to render NumberType as type="number"
42e8f5e3a2 add option to render NumberType as type="number"
[Console] Doc Block: More intuitive usage example in ArrayInput. Make the ArrayInput doc block example more self-explanatory and less misleading. Show the common use case of having `command`, and replace the confusing `name` argument with something more arbitrary. The current doc block example for `ArrayInput` seems to imply that the command name goes in as `name`, but this is actually just a random argument, named "name", in this case. 0c8d311657 Update usage example in ArrayInput doc block. add option to render NumberType as type="number"
Add a new option to specify the date format when using the `string` input type. The Descriptor throws an exception when it encounters a class having a non existent parent, see https://github.com/nelmio/NelmioApiDocBundle/issues/1470 for the record.